All housing options are on the table to help Louisiana residents displaced by August’s historic and deadly floods, including placing them in temporary trailers, according to the head of the Federal Emergency Management Agency. Fugate added that many of the trailers now are “actually above the HUD standards” and are not the “FEMA travel trailers” that became ubiquitous on the Gulf Coast after Hurricane Katrina in 2005. Those trailers, while providing immediate and relatively safe shelter for Katrina victims, also were criticized for having hazardous levels of formaldehyde, a known carcinogen linked to numerous health problems, including breathing difficulties. People typically are meant to live in the manufactured housing for up to 18 months, but many Katrina victims lived in trailers for years. FEMA also sent trailers to East Coast communities hit hard in 2012 by megastorm Sandy to provide temporary housing for people the disaster left homeless. The excessive rainfall that battered Louisiana and parts of southwest Mississippi between Aug. 11 and Aug. 14 has affected tens of thousands of people and homes in the Gulf Coast region. Over 72 hours, the southeast and south central part of Louisiana experienced 7 to 12 inches of rain, with pockets of heavy rain totaling 20 inches or more in some areas, said Alek Krautmann, a meteorologist at the National Weather Service in New Orleans. Places in southwest Mississippi also experienced heavy rainfall at the end of last week, with some towns receiving nearly 15 inches of rain within a 48-hour period. President Obama on Sunday declared the areas of Louisiana affected by the storm – which could eventually total 30 parishes -- a major disaster, making them eligible for federal assistance. Edwards said during Tuesday’s briefing that to date roughly 20,000 people had been rescued, and 40,000 residents already applied for disaster assistance from FEMA. The governor urged all Louisianans impacted by the storm to register for disaster assistance, even if they live in an areas not yet declared a national disaster. “When your parish is declared, that registration will roll over; you will not have to do it again,” the Democrat said. A Wednesday White House press pool report said that 70,000 people have registered for FEMA help under the federal disaster declaration, and more than 9,000 residents have filed flood insurance claims. Disasters create different categories of need and the government’s way of prioritizing those needs can perplex victims. Some are left homeless and need immediate temporary housing assistance; others are able to live in their homes but must wait for FEMA inspectors to assess damage if they do not have insurance. FEMA is only one of several agencies that administer disaster assistance, and figuring out who is eligible for what kind of aid often is as confusing and overwhelming as the disaster itself. Edwards also warned residents to watch out for scams. “It is important to remember that FEMA never charges for services that they deliver," the governor said. "If someone shows up at your house, if someone contacts you, and says they are a FEMA representative and they’ve got some assistance for you, but they are asking you to pull out your wallet or your checkbook or credit card, tell them 'no thanks.' That’s not the way FEMA operates." The governor on Tuesday said the number of people in shelters was slightly more than 8,000 but that that number “is changing rapidly” as victims move in and out. The governor also confirmed eight deaths, though other reports said there have been 11 flood-related deaths. “Our primary goal right now, is again, supporting the governor’s priorities,” Fugate said. “We got a lot of people in shelters, we’ve got a lot of people who may not be able to get back into their homes, so what would be the next step for temporary housing,” he said, adding that FEMA is “literally bringing in thousands of people from across the country to support this.” Fugate is regularly briefing Obama on response and recovery efforts, and Homeland Security Secretary Jeh Johnson will visit the affected region on Thursday. DHS is FEMA’s parent agency. In response to a reporter’s question about how the state, which is in a severe fiscal crisis right now, would pay for disaster recovery, Edwards said: “We are going to rely on the federal government to the maximum extent possible, which is why we are glad that additional parishes have been added, and added for the full range of assistance that is available.” FEMA typically picks up 75 percent of the federal disaster tab, while states eventually end up paying the other 25 percent. “I don’t want anyone out there to think that the fiscal situation in our state, which has been well-publicized for months now, is going to limit in any way what we’re going to do going forward to rescue people and to get them back in their homes and to take care of them as best as we possibly can between now and then,” Edwards said. The Office of Personnel Management on Aug. 11 issued guidance reminding agencies to create advance contingency plans to help employees affected by extreme weather or to fill gaps in their workforces. OPM noted flexibilities ranging from pay and benefit adjustments to telework options to emergency hiring authorities. The Postal Service implemented its emergency operations plan in the area "in order to evaluate facilities that may have been impacted by the flooding and to ensure items in the mail stream are collected, processed and delivered, wherever possible," said spokesman David Partenheimer by email. All employees in Baton Rouge and the surrounding affected areas are safe and accounted for; the agency has suspended retail services in some locations. "Wherever possible, we are collecting, processing and delivering mail if it is safe to do so," Partenheimer said. "We will continue to evaluate our operations on a daily basis and will restore delivery and retail service as quickly as possible." We immediately implemented our emergency operations plans, in order The Postal Service has suspended retail services in some locations, where postal facilities were flooded or where previous flooding damaged property. Before opening facilities to the public, we carefully evaluate the conditions to ensure it is safe for employees and customers. The Veterans Affairs Department, which has a community-based outpatient clinic in Baton Rouge, did not immediately respond to a question about the facility’s status. 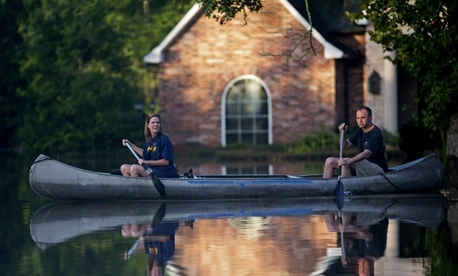 August’s heavy rainfall in the Gulf Coast region is the second to hit Louisiana this year. In March, other parts of the state were walloped with as much as 26 inches in places like Monroe. Krautmann said that August’s heavy rainfall has affected more people than the one in March because it hit the greater Baton Rouge area, which has a larger population.